It was an amphora, not a pot, but archaeologists found a literal jackpot in a dig in northern Italy last week. No word on if there was a rainbow. (ROME) — It was an amphora, not a pot, but archaeologists found a literal jackpot in a dig in northern Italy last week. No word on if there was a rainbow. 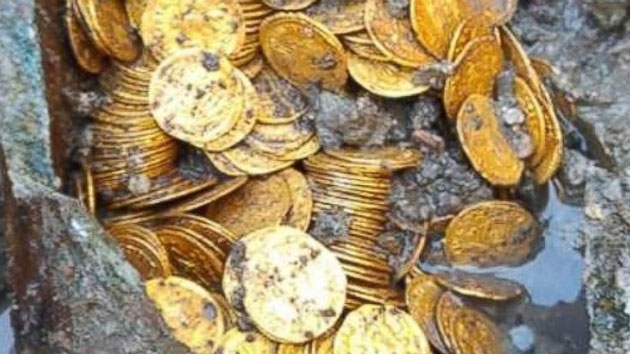 The ministry shared photos of the shiny coins, which were spilling out of an amphora — a Roman jar with two handles — buried in the dirt. The discovery was made at a dig taking place at Teatro Cressoni, a theater in Como that shut down in 1997 and has since been demolished. The Ministry of Culture said the excavation was being carried out within the “restructuring” of the theater. It’s unclear how much the hundreds of coins could be worth.